The Economic Policy Institute (EPI) is a nonprofit, nonpartisan think tank created in 1986 to include the needs of low- and middle-income workers in economic policy discussions. We appreciate the opportunity to comment on the U.S. Department of Agriculture (USDA) proposed rulemaking on SNAP requirements and services for able-bodied adults without dependents. The proposed rule changes argue that the low national unemployment rate justifies expanding SNAP’s already-onerous time limit for adults without children. This is clearly incorrect, as the national unemployment rate is just one—and likely far from the best—measure of the availability of jobs. The proposed rule changes also argue that counties or cities with a two-year average unemployment rate of 7 percent are providing ready-enough work for all residents. This is clearly incorrect, particularly for those residents facing steep barriers to work. 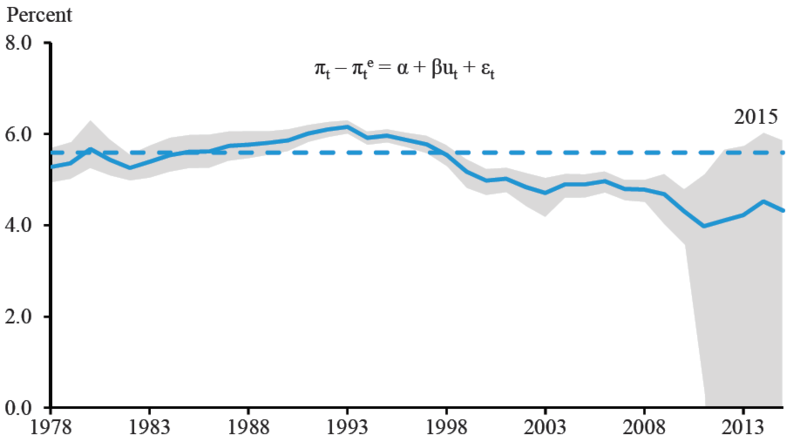 The proposed rule changes state that “only areas with unemployment rates above the ‘natural rate of unemployment’ should be considered for waivers,” stating that this natural rate of unemployment generally “hovers around 5 percent.” The natural rate of unemployment is a potentially valuable theoretical concept for economists, but is a completely unreliable empirical measure upon which to pin crucial policy decisions. The benefits of SNAP as a potential work support will be compromised by the proposed rule changes, as they will provide no boost at all to SNAP recipients’ prospects of finding steady work. SNAP work requirements are already too onerous, erring on the side of cutting off vulnerable people from assistance even as these people make good faith attempts to find work that is just not available to them in their local labor market. Any theoretical small-to-nonexistent boost to employment that would be provided by the proposed rule changes should be judged against the substantial and clear harm that would be inflicted on vulnerable people from losing access to SNAP. Below we expand on each of these points. First, however, we provide some background on the proposed rule changes that is relevant to our analysis. Under current law, SNAP participants ages 18 through 49 who are not raising minor children cannot receive benefits for more than three months in a 36-month period unless they are working or in a work training program for at least 20 hours a week. States can request waivers to temporarily exempt people living in an area with relatively elevated unemployment from the time limit, and every state but one has requested at least one waiver since the law was established in 1996. The law establishes that states can request a waiver for an area that “has an unemployment rate of over 10 percent” or “does not have a sufficient number of jobs to provide employment for the individuals.” Current regulations allow states to demonstrate that an area lacks sufficient jobs through multiple criteria, with the most common being to demonstrate that an area has an average unemployment rate that is at least 20 percent above the national average for a recent two-year period. States can also request waivers for groups of neighboring counties that demonstrate insufficient jobs under current regulations. The Trump administration has released the text of a proposed rule which would subject more people to the time limit, largely by tightening waiver criteria. The change with the greatest impact would continue to require an area to demonstrate an unemployment rate 20 percent above the national average for a two-year period, but would add a new floor that an area has a minimum of 7 percent average unemployment for two years. The overall result of the rulemaking will be to take away food from, by the administration’s own estimates, 755,000 individuals who cannot show that they are working at least 20 hours a week. The proposed rule implies that the current low level of the national unemployment rate makes it imperative to tighten restrictions on SNAP receipts, as ready work is available for all who want it. This is clearly incorrect. The national unemployment rate is just one—and likely far from the best—measure of how available steady work is to all Americans. The proposed rule changes also set benchmarks that rely on specific unemployment measures to define local labor market health. These benchmarks have no serious empirical basis and, if adopted, would cut off SNAP receipts for potential workers who are kept from obtaining work through no fault of their own. The rest of this section details how the proposed rule changes go awry by resting so heavily on premises that unemployment rates alone tell us all we need to know about labor market health. Sources: Unemployment rates are from the Bureau of Labor Statistics (BLS) Current Population Survey and wages are the average hourly earnings of production and nonsupervisory workers from the BLS Current Employment Statistics. This failure of unemployment to correlate with price-based measures of labor slack is not a surprise given that it also has often failed to correlate even with other quantity-based measures of slack. Take the correspondence between unemployment and another quantity-based measure of labor market health—the prime-age employment-to-population rate (or PAEPOP). The PAEOP measures the share of adults age 25–54 who have a job. Between its peak in October 2009 and the latest month of data, the unemployment rate fell by 6.2 percentage points. But in that same period the PAEPOP rose substantially less—just 5.1 percentage points. This differential performance between unemployment and the PAEPOP was clearly caused by much labor market weakness manifesting as reduced labor force participation rather than being fully reflected as higher unemployment. The unemployment rate measures only those workers classified as actively searching for work. If a long period of failure to find work leads potential workers to despair and stop active search, this actually reduces the measured unemployment rate. The depressing effect of the weak economy on labor force participation has been clearly shown by now.2 The upshot of this is that relying on the national unemployment rate paints an often distorted view of just how available jobs are even for the national economy and potential workforce. Further, within the national labor market, the overall unemployment rate does not reflect the experience of large subgroups of the population. Black, Hispanic, and non-college-educated workers face significant barriers to employment even in the best of times. For example, the black unemployment rate in the last four economic expansions was more than twice as high as the white unemployment rate.4 During recessions, the unemployment rates of these workers also tend to rise much more—and more quickly—than that of white non-Hispanic college-educated workers.5 For example, for each percentage point change in the overall unemployment rate between 1979 and 2014, the white unemployment rate changed by 0.9 percentage points while the black unemployment rate changed nearly twice as much—by 1.7 percentage points.6 And whereas the white unemployment rate peaked at 8.2 percent in the summer of 2010 in the worst of the Great Recession, the black unemployment rate did not fall below 8.2 percent until the spring of 2017, many years into the recovery.7 Since SNAP benefits are especially important to nonwhite workers and workers without a college degree, who experience greater barriers to finding steady work in earned income,8 it is important to consider not just average labor market outcomes, but also disparities between groups of workers. All in all, the proposed rule changes err terribly in making unemployment such a key criterion for when SNAP receipts will be restricted. A broader array of more disaggregated measures of labor market health would be far more useful for making good-faith diagnoses of the availability of work for SNAP recipients. The “natural rate” is a theoretical construction defining the unemployment rate that would be observed in a healthy economy where the level of aggregate demand (or spending by households, businesses, and governments) exactly matched the economy’s potential productive capacity. If unemployment is pushed below the natural rate by a spell of strong growth in aggregate demand, then the result is thought to be mostly more inflation, not more employment or output. Similarly, as recently as 2012, estimates of the natural rate from the Congressional Budget Office (CBO) hovered between 5.1 and 5.8 percent, yet actual unemployment has been beneath 5.1 percent since August 2015, and has been at or below 4.0 percent since March 2018, all with no durable acceleration of inflation. Notes: This chart is from 2016 Economic Report of the President. NAIRU is the unemployment rate that keeps inflation stable. It is calculated as α/β. Dashed line represents result from regression over entire sample period. Shaded area indicates a 50 percent confidence band around the point estimate, calculated using a method discussed in Staiger, Stock, and Watson (1997) for analyzing the ratio of the means of two dependent normal random variables. Confidence bands since 2012 include implausible negative values. Of course, excessive focus on the national unemployment rate can blur the assessment of conditions facing large swaths of the American workforce, as economic shocks do not affect all parts of the country equally and some groups of potential workers face persistent barriers in finding work even when the national unemployment rate or the overall unemployment rate in their local labor market is relatively low. For example, national unemployment rates for African American workers and workers without a college degree are consistently above the overall unemployment rate, as shown in Figure C.
Note: Data reflect 12-month moving averages as of the latest month of data. This empirical finding that nonwhite workers and workers without a four-year college degree face durable barriers to finding work persists even when looking at more finely grained geographic labor markets. 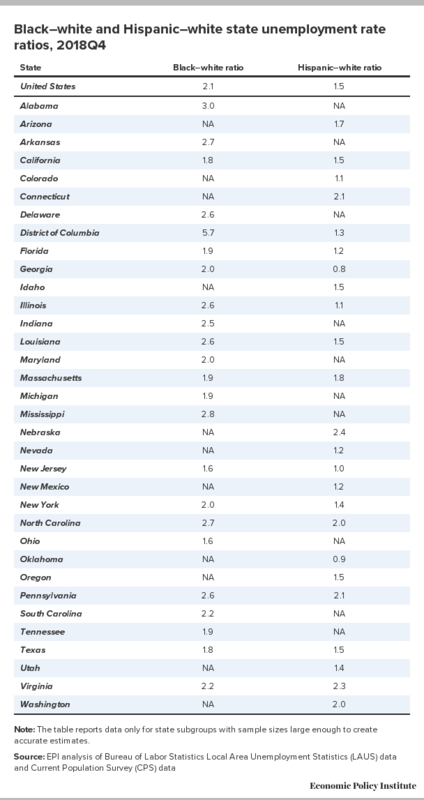 For example, Table 1 ranks states by the ratio of African American to white unemployment rates. In no state is this ratio less than 1.6. Even if this racial disparity in unemployment rates was driven entirely by worker characteristics (say that African American workers received far fewer public resources during their educational careers due to historic discrimination in housing markets and schooling), it would still be profoundly unfair to assume that simply depriving potential workers of SNAP benefits would somehow boost their employability. 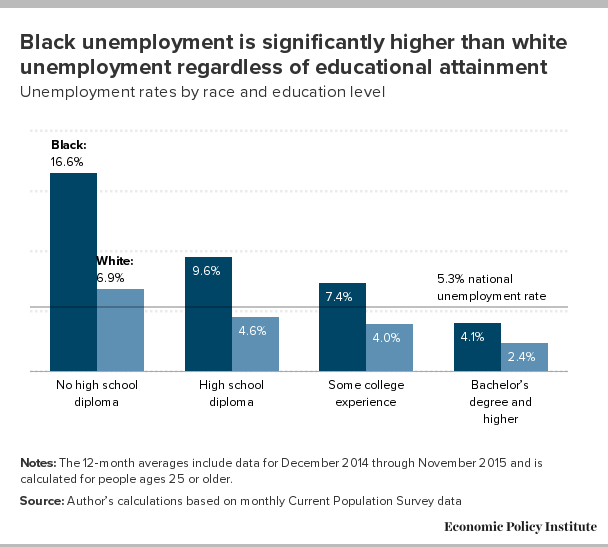 More importantly, it is clear that this racial disparity in unemployment rates is not driven simply by workers’ characteristics—Figure D shows unemployment rates for white and African American workers by educational attainment; African American rates are higher across each educational category. Given that the racial unemployment gap persists even within well-defined educational attainment categories, this highlights strongly that racial discrimination is a prime barrier for many African American workers’ ability to find work. The proposed rule changes to SNAP work requirements will hence largely end up punishing job-seekers of color for historical legacies of racism. Notes: The 12-month averages include data for December 2014 through November 2015 and is calculated for people ages 25 or older. Finally, the administration’s proposed rule changes highlight 7 percent county-level unemployment as a floor beneath which waivers from work requirements would not be granted, on the basis that 7 percent unemployment constitutes a healthy labor market. 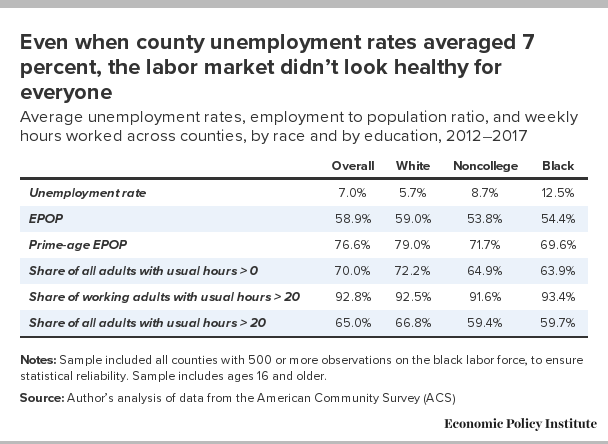 To test this proposition, we looked at county-level unemployment rates, prime-age employment to population rates (PAEPOPs), and the shares of workers with at least 20 hours of work on average across the previous year. All data was obtained from the American Community Survey (ACS). To ensure large enough sample sizes to calculate race-specific measures, we restricted our analysis to counties with 500 observations in the labor force for African American workers, and we pooled all counties over the years 2012 to 2017. The findings are summarized in Table 2 below. Overall the county-level average unemployment rate in our sample is exactly the 7.0 percent that the administration indicates constitutes a healthy labor market. Yet the PAEPOP in the sample is just 76.6 percent, far less than the national business cycle peaks seen since 1989, and roughly equivalent to where the national PAEPOP sat in mid-2014—a full 18 months before the Federal Reserve determined the national economy was healthy enough to begin raising short-term interest rates off of zero. Notes: Sample included all counties with 500 or more observations on the black labor force, to ensure statistical reliability. Sample includes ages 16 and older. Additionally, the unemployment on average for noncollege workers in these counties is 8.7 percent—a rate that prevailed overall at the national level in 2011, a year where jobs recovery from the Great Recession was just a year old. For African American workers in these counties, the unemployment rate was 12.5 percent. For African American and noncollege workers, who account for disproportionate shares of SNAP receipts, these are not numbers indicating a healthy labor market. Finally, the share of adults in these counties working 20 or more hours in a typical week varies enormously. For white workers, this share is 66.8 percent, but for noncollege workers it is just 59.4 percent, and for black workers it is 59.7 percent. Conditional upon finding any work, the usual weekly hours across groups are quite close, but clearly the real barrier is finding any work at all—even in counties that saw an average unemployment rate of 7 percent over the sample. All in all, our judgement is that the proposed rule changes make far too sweeping assumptions about how a single indicator—the overall unemployment rate—can accurately diagnose whether or not sufficient work will be readily available to SNAP recipients. If one were serious about measuring the health of labor markets that SNAP recipients participate in, one would need to use a much richer set of indicators and much more disaggregated data. The insufficiency of the administration’s benchmarks for shielding vulnerable workers from benefit cut-off, even when jobs are not available to them, is striking. The rest of this comment focuses briefer remarks on other aspects of the proposed rule changes. With some exceptions, federal law limits SNAP eligibility for adults without dependent children to three months out of every three years unless recipients are able to document 20 hours of work per week. This strict time limit deprives unemployed and underemployed adults of food benefits when they most need them to mitigate the harm from lost earnings. Though aimed at adults without dependents, the time limit also harms children and other relatives living in poverty who depend on shared resources from extended family members. In addition to harming recipients, the strict time limit for SNAP recipients without dependent children shifts costs to state and local governments, food banks, and other charities. Elsewhere, we have criticized the rigidity of work-hours tests in SNAP and strongly objected to making them even more restrictive. As in previous proposals to tighten work requirements, the proposed rule would not help more SNAP recipients find steady work or receive job training, but would simply use their inability to find steady work as an excuse to cut off benefits. Area waivers and individual exemptions currently offer some welcome flexibility from SNAP’s work requirements. States are currently able to mitigate the impact of work requirements by requesting waivers for areas where jobs are scarce, a provision every state except one has availed itself of at least once. The area waivers provision recognizes the added challenge of finding work in hard-hit areas and serves as an economic stabilizer during economic downturns by injecting spending power into local economies. In addition to area waivers, federal law gives states the discretion to exempt up to 12 percent of SNAP recipients without dependent children from time limits. These individual exemptions, until recently capped at a higher 15 percent limit, are a lifeline for some of the most vulnerable recipients, including former foster children entering the workforce, domestic violence survivors, formerly incarcerated individuals, and workers with chronic health conditions. Individual exemptions can help recipients who do not live in high-unemployment areas but who nevertheless face special challenges in obtaining and maintaining steady work. States are able to carry over unused exemptions in order to use them when they are most needed. Arbitrarily limiting the duration of area waivers to 12 months after USDA has processed a request may delay or cut off benefits at times when the economy is in a prolonged downturn and these benefits are most needed. As the Great Recession showed, there is no automatic time limit or “bottom” to a recession, especially if the fiscal policy response has been inadequate. Arbitrarily limiting the duration of area waivers increases administrative costs and the likelihood of implementation delays and does not promote work when there are more applicants than jobs. If anything, such limits are a fiscal drag that may serve to lengthen recessions, idling workers and needlessly reducing economic output. The proposed rule would not promote work or encourage self-sufficiency. The Department’s stated purpose for the proposed rule is to help nondisabled SNAP participants move out of poverty and into work in a manner consistent with the goals of the Food and Nutrition Act of 2008, which include food security, self-sufficiency, well-being, and economic mobility. We share these goals. However, the proposed rule would actually undermine the goals of food security and well-being without helping recipients achieve self-sufficiency and economic mobility through steady employment. The administration’s own analysis finds that two-thirds of beneficiaries who would be newly subject to the time limit under the proposed rule would not be able to meet work requirements, and thus would face hunger and food insecurity for no reason. While this implies that USDA expects that one-third will meet the work requirements, USDA provides no evidence to suggest that this share will be higher as a result of the proposed changes, given that many will find work regardless. There is no economic rationale for limiting states’ ability to carry over unused individual exemptions. Banking exemptions gives states the flexibility to target benefits to those who need them most, when they most need them. Requiring states to use or lose exemptions is harsh and inefficient because states can target them to people in greatest need if they are able to save them for hard times. As with the other arbitrary and rigid limits proposed in this rule, limiting states’ ability to bank exemptions would weaken SNAP’s effectiveness as an automatic stabilizer. It also undermines the stated purpose of the proposed changes to area waivers, which is to better target benefits to recipients whose job prospects are limited by high unemployment. SNAP benefits are modest and cannot sustain a person or a family in the absence of earnings or other sources of income. Most nondisabled working-age adults receiving SNAP benefits are already in the labor force. Six in 10 are currently employed and eight in 10 are employed within a year of initial SNAP receipt.21 The problem is not that SNAP discourages work, it is that even with SNAP workers struggle to feed their families. By the administration’s own estimation, the proposed rule would take food away from 755,000 low-income Americans without any projected improvements in health or employment. Since the proposed rule changes would do demonstrable harm with no apparent benefits, it serves little purpose aside from saving a small amount of money—$15 billion over 10 years—at the expense of some of the most vulnerable people in the country. Moreover, the administration’s proposed rule seeks to circumvent Congress, which recently conducted a review and reauthorization of SNAP without recommending such changes. In addition to raising the living standards of beneficiaries, SNAP benefits are critical to beneficiaries’ physical and mental well-being. Food insecurity has been shown to increase the risk of negative health outcomes.22 To cite just one example, research has found that hospital admissions of low-income people for hypoglycemia increased by over a quarter in the last week of the month—as food budgets are exhausted—compared with the first week of the month.23 Physical and mental well-being are obviously key bolsters to the ability to undertake a meaningful job search and secure durable employment. For these reasons, we strongly oppose the proposed rule that would expose even more vulnerable citizens to arbitrary time limits. 1. 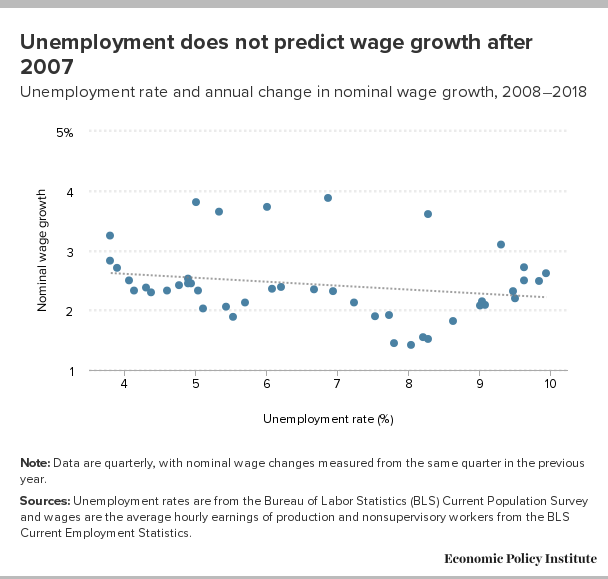 See Josh Bivens, “Predicting Wage Growth with Measures of Labor Market Slack: It’s Complicated,” Working Economics Blog, Economic Policy Institute, March 19, 2019. 2. Josh Bivens and Ben Zipperer, The Importance of Locking in Full Employment for the Long Haul, Economic Policy Institute, August 2018. 3. See, for example, Rebecca M. Blank, “If the Economy’s So Bad, Why Is the Unemployment Rate So Low?” Testimony before the U.S. Congress Joint Economic Committee, March 7, 2008. 4. Valerie Wilson, The Impact of Full Employment on African American Employment and Wages, Economic Policy Institute, March 2015. 5. 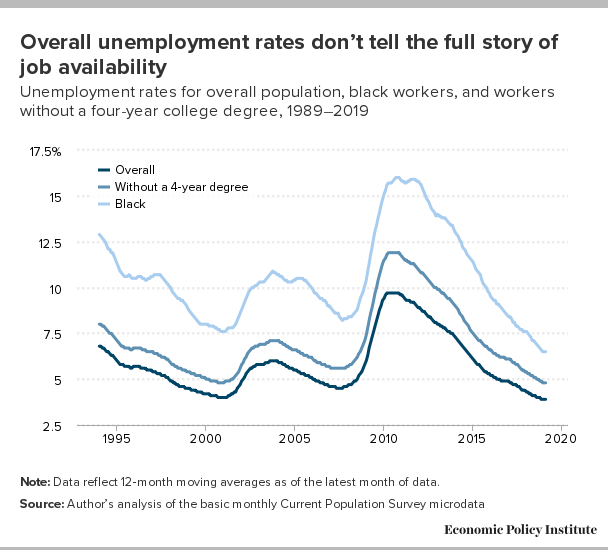 See, for example, Elise Gould and Valerie Wilson, “The Black Unemployment Rate Returns to Historic Low, but Not Really,” Working Economics Blog, Economic Policy Institute, July 7, 2017; Valerie Wilson, “Before the State of the Union, a Fact Check on Black Unemployment,” Working Economics Blog, Economic Policy Institute, February 1, 2019. 6. Valerie Wilson, The Impact of Full Employment on African American Employment and Wages, Economic Policy Institute, March 2015. 7. Authors’ analysis of BLS unemployment data by race, accessed through EPI’s State of Working America data library on March 20, 2019. 8. Kathryn Cronquist and Sarah Lauffer, Characteristics of Supplemental Nutrition Assistance Program Households: Fiscal Year 2017, U.S. Department of Agriculture, Food and Nutrition Service, February 2019; Brynne Keith-Jennings and Raheem Chaudhry, Most Working-Age SNAP Participants Work, But Often in Unstable Jobs, Center on Budget and Policy Priorities, March 2018; Brynne Keith-Jennings, Policy Brief: Labor Market Facing SNAP and Medicaid Participants Offers Low-Paying, Volatile Jobs, July 2018. 9. See Carl E. Walsh, The Natural Rate, NAIRU, and Monetary Policy, Federal Reserve Bank of San Francisco Economic Letter, September 2018. 10. 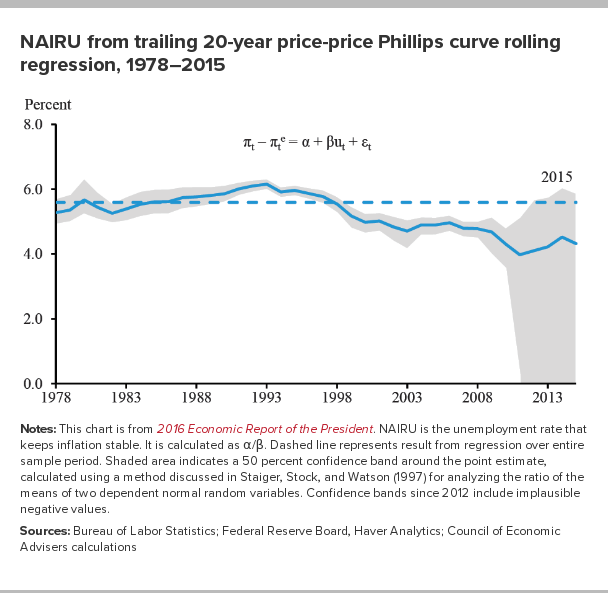 See Douglas Staiger, James Stock, and Mark Watson, “The NAIRU, Unemployment and Monetary Policy,” Journal of Economic Perspectives 11, no. 1 (Winter 1997): 33–49. 11. Council of Economic Advisers (CEA), “The Year in Review and the Years Ahead,” in Economic Report of the President (February 2016), 51–117. 12. Josh Bivens and Shawn Fremstad, Why Punitive Work-Hours Tests in SNAP and Medicaid Would Harm Workers and Do Nothing to Raise Employment, Economic Policy Institute, July 2018. 13. Ed Bolen and Stacy Dean, Waivers Add Key State Flexibility to SNAP’s Three-Month Time Limit, Center on Budget and Policy Priorities, February 2018. 14. David Cooper, Lawrence Mishel, and Ben Zipperer, Bold Increases in the Minimum Wage Should Be Evaluated for the Benefits of Raising Low-Wage Workers’ Total Earnings: Critics Who Cite Claims of Job Loss Are Using a Distorted Frame, Economic Policy Institute, April 2018. 15. Lonnie Golden, Still Falling Short on Hours and Pay: Part-Time Work Becoming New Normal, Economic Policy Institute, December 2016. 16. Katherine Abraham and Melissa Kearney, “Explaining the Decline in the U.S. Employment-to-Population Ratio: A Review of the Evidence,” National Bureau of Economic Research Working Paper 24333, February 2018. 17. One unpublished study found modest disemployment effects among less-educated immigrants, in response to SNAP eligibility (Chloe N. East, “Immigrants’ Labor Supply Response to Food Stamp Access,” University of Colorado Denver Working Paper, January 2018). However, the subset of SNAP recipients who were found to reduce labor supply in response to SNAP included households with dependent children who would not be affected by the proposed rule. Further, the immigrant sample in that particular study is also not typical of SNAP beneficiaries in a number of ways. Among other things, immigrants in the sample were younger and much more likely to be married and to have children than U.S.-born persons in the comparison group, which was limited to households headed by someone with a high school education or less. Immigrant men were more likely, and immigrant women were less likely, to be working than their U.S.-born counterparts. 18. Brian Stacy, Erik Scherpf, and Young Jo, “New Evidence on Labor Supply and the SNAP Program: What Are the Roles of Work Requirements, Expanded Eligibility, and New Program Rules?,” working paper, May 25, 2016, presented at the Association for Public Policy Analysis and Management (APPAM) Fall Research Conference, November 3–5, 2016, Washington, D.C.
19. U.S. Department of Agriculture Food and Nutrition Service, Supplemental Food and Nutrition Assistance Program: FY16 through FY19 National View Summary, November 2018, accessed March 8, 2019. 20. Liana Fox and Laryssa Mykta, Supplemental Nutrition Assistance Program Lifts Millions out of Poverty, U.S. Census Bureau, September 2018. 21. Ed Bolen and Stacy Dean, Waivers Add Key State Flexibility to SNAP’s Three-Month Time Limit, Center on Budget and Policy Priorities, February 2018. 22. Heather Hartline-Grafton, “The Impact of Food Insecurity on Women’s Health,” Food Research & Action Center (FRAC) blog, n.d.; FRAC, The Impact of Poverty, Food Insecurity, and Poor Nutrition on Health and Well-Being, December 2017; James Mabli and Julie Worthington, “Supplemental Nutrition Assistance Program Participation and Child Food Security,” Pediatrics 133, no. 4 (2014): 610–619; Caroline Ratcliffe, Signe-Mary McKernan, and Sisi Zhang, “How Much Does the Supplemental Nutrition Assistance Program Reduce Food Insecurity?,” American Journal of Agricultural Economics 93, no. 4 (2011): 1082–1098; Mark Nord, “How Much Does the Supplemental Nutrition Assistance Program Alleviate Food Insecurity? Evidence from Recent Programme Leavers,” Public Health Nutrition 15, no. 5 (2012): 811–817; Christian A. Gregory and Partha Deb, “Does SNAP Improve Your Health?,” Food Policy 50 (2015): 11–19; Seth Berkowitz et al., “Supplemental Nutrition Assistance Program (SNAP) Participation and Health Care Expenditures Among Low-Income Adults,” JAMA Internal Medicine 177, no. 11 (November 2017): 1642–1649. 23. Hilary K. Seligman et al., “Exhaustion of Food Budgets at Month’s End and Hospital Admissions for Hyperglycemia,” Health Affairs 33, no.1 (January 2014): 116–123.